Many of the programs we have seen are far too complicated for a small and medium sized businesses and therefore we wrote our own which you can download for FREE. 18,532 downloads since March 2007. Very fast start up. Just enter your company details, add a client and your ready to start invoice printing. 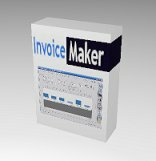 Keeps all your invoices in one place for easy viewing and marking as paid when the money comes in. No more trawling through loads of Word or Excel documents to find the one you want. All the data can be exported to other programs should your company require migration to a different system in the future. Easily back up your entire database for safe storage and recovery incase of disaster. Right clicking on invoice items brings up mouse pointer menus for fast access to advanced options. Export your invoices to PDF format for Automatic emailing to customers. Prints dl envelopes with one click of the mouse. Works in any currency you can even set your local VAT/GST rate.